One of the things I love the most is being outdoors and camping, so I was really excited to get Natazha and Taya out on our first camping trip as a family. 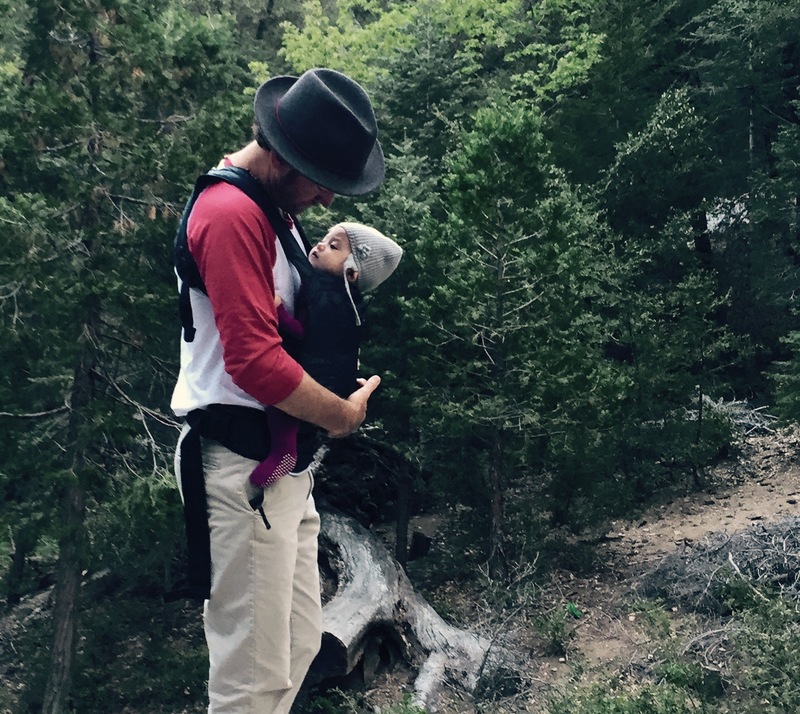 Taya is six months old, and camping with a baby means more than just a new checklist and more stuff to pack… it was one of those times that you know even as it is happening that you are making exciting adventure family memories that will last a lifetime. For a lot of parents just treading water through the everyday challenges of parenthood is adventure enough. The first couple of months are a bleary-eyed sleep deprived walking zombie cycle of wonderment, diapers, and feedings. The expression “I could do that in my sleep” must certainly be a literal reference to skills acquired by parents during this phase. You come up with more ways to describe baby poops than eskimos have to describe snow. No book can prepare you for parenthood either, but it doesn’t matter because you won’t be reading anything longer than a text message again until they hit preschool. No time for that. Time goes by faster and faster but you also start to appreciate the precious moments even more. A type of love you can’t put into words becomes as real as gravity and shifts the orbit of your entire universe around the tiny human that you and your partner created. You want to show the world to this little one. For our first camping trip I picked a campsite near the top of Palomar mountain, east of San Diego. I had scoped it out on a motorcycle ride a couple of weeks earlier and knew it would be a great spot. Palomar mountain has a long history, but is probably best known these days as the home to the Palomar Observatory, which houses the Hale telescope. The observatory was built in the 1940’s by CalTech and was the largest telescope in the world for 40 years. Famous astronomer Edwin Hubble, along with others, used it to discover quasars and the first direct evidence of stars in other galaxies. Palomar Mountain has been called “a hanging garden above arid lands” because of it’s microclimate and ecosystems that contrast to the surrounding dry desert region. It has oak, fir, and tall pine trees, springs of water bursting from the hillsides, is often snow capped in winter, and gets six times as much rainfall as nearby San Diego. Before the white settlers arrived it was a favorite hunting and camping ground of the Luiseno Indians, and we saw evidence of their presence there in the rocks surrounding our campsite. There were over a dozen bowl-size depressions in the exposed granite rocks under the trees where they had created mortars for grinding acorns and seeds. Between the connection to the first people, and the connection to the stars, this mountain definitely radiates a special energy. Camping in California these days doesn’t allow for much spontaneity, at least not on the weekends. Eighty percent of the campsites in the State Park campgrounds can be reserved ahead of time (via ReserveAmerica.com ) and the remaining 20% are first-come first-served. If you have any flexibility in your schedule I suggest trying to camp during the week, as the ranger told me that all of the sites were reserved for every weekend from now until September! We arrived on a Thursday and out of 20 sites in the area only 2 were occupied, so we were able to get a really nice “walk-up” site that was tucked away in the trees. The girls and I set up camp and then explored some nearby trails as the sun eased down to the west and the near full moon climbed the night sky. We had a little impromptu Z+N photo shoot before grilling out and toasting marshmallows over the fire. Taya soaked in her first wilderness experience like a pro. Our “car camping” tent is a palatial REI Kingdom 4, which has plenty of room to stand up and stretch out, and can even be divided into two rooms. For our bed we have two Thermarest NeoAir Dream mattresses. They are inflatable with a memory foam top, and are the only camping mattresses I found that you can connect together to make one big bed. I also invested in really nice sleeping bags that kept us toasty warm, which I was especially thankful for when the temperature dropped more than the weather forecast predicted. I carry my clothes and personal stuff in a waterproof Gil duffel bag (a carry over from my sailboat, surf, and dive trip adventures) which is nice camping because it not only protects from moisture but also keeps the rest of your stuff from smelling like campfire. (I also improvised a baby chair out of it because I forgot to bring a seat for Taya while eating and didn’t want to drag the carseat out over to the campsite.) For hiking the Ergo baby carrier was clutch, and the one we have packs down really small and is made from a lightweight material. For a cool diaper duty kit I packed Taya’s Fawn and Cub Yucca Mat, which is a handmade mini Navajo rug changing pad (cool addition to any Sherpa-pa’s dad kit). Taya isn’t crawling yet, but if your baby is starting to scoot and you need to corral them in the campsite I recommend the Lotus travel baby crib, it is super light and easy to set up and comes with sunshades and mosquito net attachments. There was for sure a lot more gear, but that’s what comes to mind for now. Whatever you carry with you remember the most important to have is the spirit of adventure and the willingness to pass that on to your children. Share your passions and the world with them young! This was beyond precious! I soooo look forward to your updates!!! !